Dean Condie Jensen passed away June 3, 2018 at the Banner Heart Hospital in Mesa, Arizona, at the age of 71, with his wife and children by his side. Born in Boise, ID, Dean was the third son of Weldon Tolman Jensen and Roma Condie. He graduated from Rancho High School in Las Vegas, Nevada, and served in the Northern Indian LDS mission based in Rapid City, South Dakota. Dean married Margaret Jean Hoopes, of Thatcher, Arizona, in the LDS Mesa Temple in 1967. They are the parents of seven children – all raised in Mesa and all married: Aliesa (Craig), Greg (Tracy), Steven (Sally), Spencer (Alison), Sterling (Lindsay), Scott (Liza) and Burkley (Jenni). 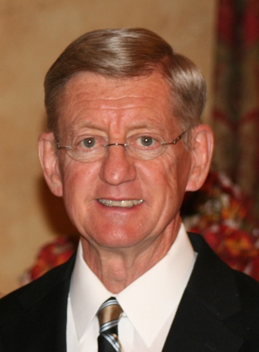 Dean received a bachelor’s degree in business administration from the University of Nevada Las Vegas. As a general contractor in Arizona, Dean built residential homes in the 1970s, commercial buildings in the 1980s, a chain of 50s diners in the 1990s, and two Mexican restaurants in the early 2000s. Dean built all four of the permanent homes in which he and Jean raised their family: one in Las Vegas and three in Mesa. Dean and Jean have centered their entire lives around family values and Christian service. Dean served as a bishop, mission president and in many other callings in the LDS Church. They have been blessed to acquire many friends in Arizona and around the world from their travels and missions. In 1988 Dean and Jean and their children were called by the LDS Church to serve for one year as work volunteers at the church-owned historical site of Adam-ondi-Ahman, in Missouri, where Dean’s assignments included the tree nursery. In 1991 Dean volunteered with the LDS Benson Institute, living with the family in Oaxaca, Mexico where the four youngest children attended Spanish-speaking schools for a year while Dean and Jean taught English. From 2003 to 2007 Dean and Jean served in the Indonesia Jakarta LDS mission – first as full-time missionaries and then as mission president. In the intervening nine years they have kept in close contact both with the hundreds of missionaries they trained and with whom they served, as well as with many of their Indonesian friends. For the past nine years, from 2009 through 2017, Dean served as a counselor in the Mesa Salt River LDS stake presidency. At the time of Dean’s passing he and Jean were preparing to serve another LDS mission, in Chile. For nearly five decades Dean and Jean have been pillars in the East Valley community. Dean participated in local business and civic organizations, political campaigns and served for decades in many capacities in the Boy Scouts of America, earning its prestigious Silver Beaver award. His lifetime of selfless service included countless hours of doing manual labor, odd jobs and projects for his married children, and spending personal one-on-one time with his 28 grandchildren and one great-grandchild (born in 2018). Dean lived life to the fullest with many interests and hobbies including participation in high school and college wrestling, Native American adoption programs, piloting planes, gardening, hiking, mountain biking, boating, skiing, birding, making pizzas, and building things – many things – from pinewood derby cars to campsite “furniture” to replicas of religious artifacts. The crown jewel of Dean’s craftsmanship was the family cabin he recently built (nearly single-handedly) on the Mogollon Rim, finishing it mere weeks before he passed away. Besides his wife Jean and their seven married children, Dean is also survived by brothers Tom and Jon, and sisters Sally, Nancy and Kathy. He will be missed by his family and friends and the many lives he touched. A viewing for family and friends will be held Friday, June 8, 2018 from 6-8 p.m. at the Bunker University Chapel, 3529 E. University Dr. in Mesa. Funeral services will be held on Saturday, June 9 at 1:00 p.m., at the Mesa Arizona Salt River Stake Center, 6942 E. Brown Rd., Mesa. A brief graveside service will be held immediately following the funeral. Interment will be at the Mesa Cemetery, 1212 N. Center Street. Condolences may be sent to www.bunkerfuneral.com . What a great loss! It was just a week ago Sunday (Memorial Day Weekend) that President Jensen shook my hand as he was leaving Sunday School headed to Priesthood. He was always good to reach out to me. Most importantly he was good to reach out to Fred who as you know is not LDS, but has been attending sacrament meeting with the family for almost 12 years now. Over the years, it’s been exciting to follow the two of you on your Indonesian Mission that ended up being extended and travels visiting children. I visit taught Liza in your home when Tara and Demark were little ones. Tara also took Let’s Play Music lessons with Rebecca Squires in your home. You & Dean were on a mission at that time. Years later I attended the weekday gospel study class and I’ll never forget the time we baked pies or the time you had a big poster in your home wishing me a happy birthday. I will always treasure time spent in your home. Jean, I’m sure it wasn’t always easy having a husband with so many leadership responsibilities. I will tell you though that his talks during stake and ward conferences always stood out to me. I vividly remember the few times I had my temple recommend interview with him. Thank you for sharing him with the Salt River Stake. You are both true examples of doing things the Savior’s way and staying on the covenant path. Thank you for that example. Do know that you have a ward family that loves you. I’m grateful to have been in the same ward and stake through the years! May peace be with you during this difficult time and through the years to come. Dean Jensen had many fans, but none greater than myself. Each time he stood to speak or teach, I was filled with desire of wanting to be a better man. I loved his frank, candid & bold but respectful manner in which he taught. Many men & women are simply better people because of him. Our family just met Dean within the past year and in that short period of time he had a profound impact on my life. Dean was always friendly and welcoming. I always looked forward to his insight during Sunday classes and to hear his testimony of Jesus Christ and the restored gospel. Serving with Dean in Cub Scouts the past few months was a wonderful experience to learn from a great leader and faithful saint. You could feel his love for the gospel, willingness to serve and dedication to the community. My final memories of Dean are him giving countless hours of prep and an entire Saturday leading the rocket launch for the Cub Scout Day Camp. Jean – thank you for sharing your husband with us, we express our most sincere condolences to you and your family. We are so sad that we are not with you right now as you honor your amazing husband, father, grandfather, and friend. It seems the Jensen family has been part of our family for many years, even when you moved away from our neighborhood. Your example of service and love knew no bounds. We have felt of your love and your kindness, and will forever be grateful for it. Please know of our thoughts and prayers and deep sympathy in the loss of Dean. He was one incredible man, and will be deeply missed. I will always call you as my former mission president, even you had been released from that calling many years ago. I do still remember when I was having difficulties with my parents who were not member of the church ,to get permission serving as a full time missionary. As I was a new member at that time , I had a big desire to serve as a full time missionary but my parents didn’t give me permission to do so. Then you visited me and my parents in Medan (Indonesia) to explain about the church and missionary work to my parents. As president Jensen came to my house and talked to my parents about my desire to serve the Lord, I felt your spirit and your deepest love very touched me, even my parents got mad at president Jensen but president Jensen still showed his pure love, kindness, and respectful to my late parents. Before he left my house, he gave a wonderful pray for me and my parents that throung the restored gospel and the Savior, I would be able being a light and good exampler for my parents and my relatives. That wonderful pray was significantly changing my life. And President Jensen gave me a blessing that I would serve as a full time missionary as I honored my parents and be a good example to them. As I heed his pray and lived the gospel in my daily life, finally my parents allowed me to serve as a full time missionary. Then I was confirmed as a full time missionary by President Jensen in his office, and a wonderful blessing he gave to me when he laid down his hands on my head, that throung my serving as a full time missionary my parents will receieve the fullness of the restored gospel. When I sealed my parents in the Lord’s House, I could feel very strongly the spirit (soul) of my late parents had recieved the fullness of the restored gospel in the spirit world. I am very grateful and thankful for the blessing my former mission president Jensen gave to me. I do know that my lateparents were so thankful to president Jensen in the veil now and both of my lateparents and president Jensen are serving the Lord in the spirit world. I love you so much my beloved president Jensen and sister Jensen, and Jensen’s familly as well. I am filled with love as I read the posts about the life of service your family has led. You are an inspiration! Thank you. I have a memory of such service in my own home growing up. When your family returned home from in Adam-ondi-Ahman, my dad, Chris Albright, received a wooden box (probably crafted by Dean) with several items in it. I do not remember all the items, but I know there was a huge thorn, seeds, etc from your mission. Each item in the box had a parable to the gospel of Jesus Christ. My dad used this box in our home teaching visits and for family home evening. Thank you so much for the memories and example of your family. I love you all very much. I pray you will feel of your father’s love as he watches over you from the other side. May God continue to bless the Jensen family.